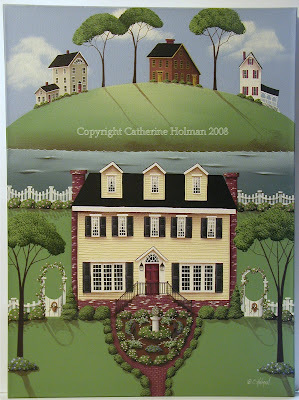 A while back I did a custom painting for a sweet customer, Laura, who wanted me to do a painting of the place where they were married as a gift for her husband. You can view that post here. This year she asked me to do a painting for her sister, Marian, and brother in law, Doug. They had recently purchased a new home and she wanted me paint a picture of them in front of the barn on their property. Doug had given Marian a dragon weathervane as a gift, so I added that to the top of the barn. She has given them their gift, so I thought I would now share it with you. Marian and Doug I wish you a life time of wonderful memories at your new place and with the new little one that's on the way! What a great place to raise children. Last night I listed the painting below at the starting price of $1.00. Yes, I said $1.00! So, if you've never been able to bid on one of my originals because of the price, now is the time to try. The shipping for this painting is $32.95 (includes insurance and delivery confirmation) because it's an oversized package. They charge more for size than weight. This painting is 18 inches by 24 inches. "Traveler's Ease at Turtle Cove"
If you're looking for that perfect place to rest your weary head, you should venture to Traveler's Ease Inn on Turtle Island. Owners, Leota Mae and Harley Thompson, will have a warm and cozy feather bed fluffed and waiting. They will greet you with a pot of herbal tea and cranberry muffins with orange frosting. Customers quickly become friends with the Thompson family and return for years to come. 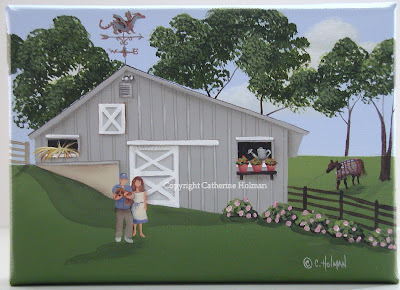 I love the sweet barn painting! And your newest one I am sure will be scooped up quickly! These are lovely Catherine...I especially love the barn, with the couple standing outside, holding their puppy....very very sweet. Great work. Ow, I also love the gallery canvas. Another one I love! You do absolutely beautiful work! Catherine, I think these 2 paintings are great! What a nice gift for that couple! I'll have to keep you in mind for some gifts this year! Keep up the wonderful art you make! What wonderful work. I'm still thinking about a custom painting of our home when the flowers are in full bloom. 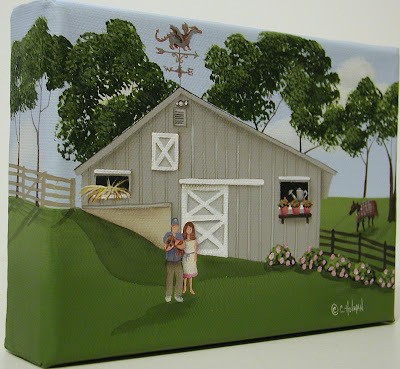 the barn painting is lovely! they must be delighted!! These are great, what a talented lady you are. I'm working on a surprise for my sister..almost finished...will post it in flickr and in my blog, come see me!! 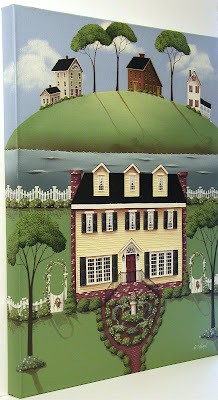 It's a beauty and reminds me of a spot along the Maine coast with just such a house. You bring such beauty to home in your artwork. Your work reminds me of Linda Andersons who resides in Georgia. Very creative. The painting you did for your friends is absolutely beautiful, I think the best yet! It's so lovely, thank you for sharing it. Love the custom painting! What a wonderful idea and you did such an amazing job! They will cherish that always!